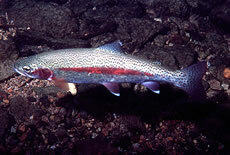 The steelhead is also called the rainbow trout and was once only found in North America and Siberia. They were introduced to other habitats and can now be found worldwide. Adult specimens can reach a total of 14.5 inches in length and can weigh up to 20 lb. The steelhead lives only up to eight years. It is green in color with black spots, and it has white or yellowish underparts. One stripe appears on each of its sides that is pink to red in color. Steelheads are found in lakes, streams and coasts with water less than 35 feet deep, and they are able to survive in a wide range of temperate conditions. Young steelheads travel to lakes where they wander in the shallow sections searching for plankton, minnows, insects and other aquatic creatures. Spawning takes place in streams (usually in the streams that they themselves were born in) from late October to early May. The eggs hatch after four to seven weeks. Steelheads found on the southern California coast and in the North Pacific Ocean were listed as endangered due to a decline in numbers, possibly due to poor feeding conditions in the areas, predation by marine mammals, and ocean drift-net fishing. Copyright Notice: This article is licensed under the GNU Free Documentation License. It uses material from the Wikipedia article "Rainbow trout". Glenn, C. R. 2006. "Earth's Endangered Creatures - Steelhead Facts" (Online). Accessed 4/24/2019 at http://earthsendangered.com/profile.asp?sp=874&ID=9.